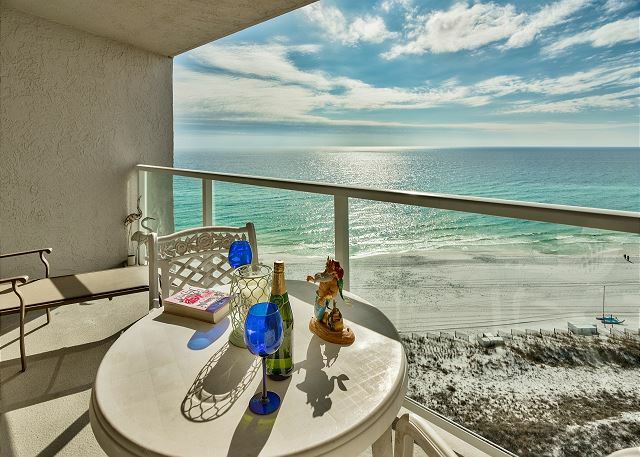 This unit is located on the 13th floor with 972 square feet in desirable Beachside II offering breathtaking views of the emerald green waters and white sand beaches. 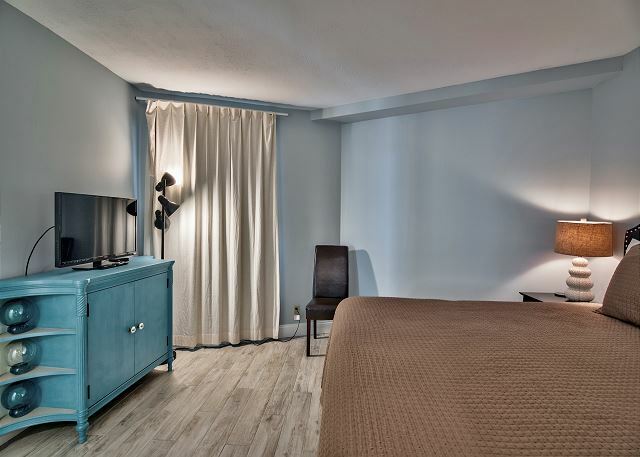 Fresh paint throughout, new tile, a completely new A/C system and other furnishings to add to the pleasure of the guest. 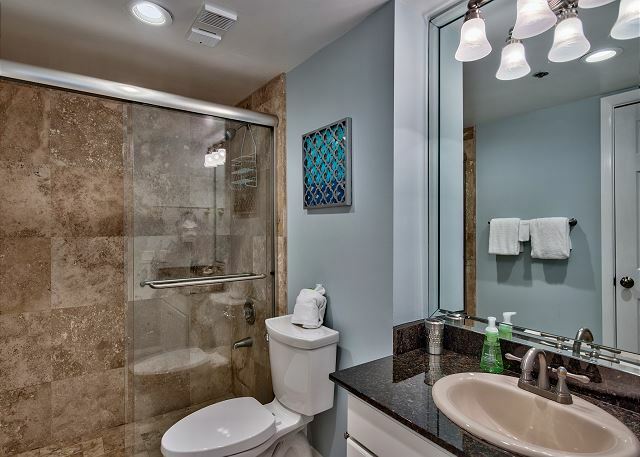 Adjacent to the bedroom is the bathroom with walk-in shower. 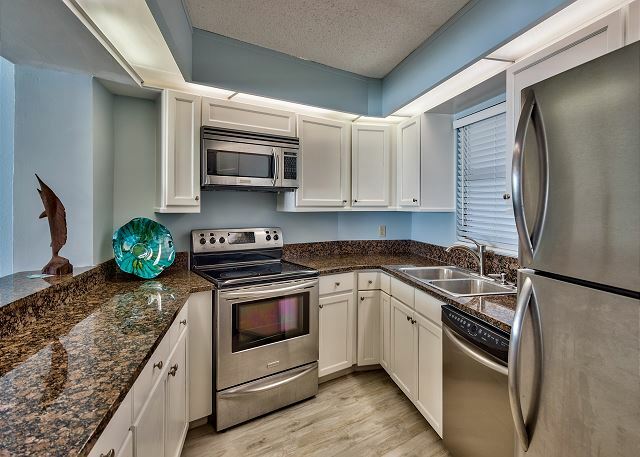 This 13th floor unit provides all you could possibly need for your escape to the Sandestin Golf and Beach Resort and includes washer/dryer within the unit, free wifi, 2 beach chairs and an umbrella in the unit for your use, free tram to Baytowne Wharf, and no check in lines-go directly to the unit. 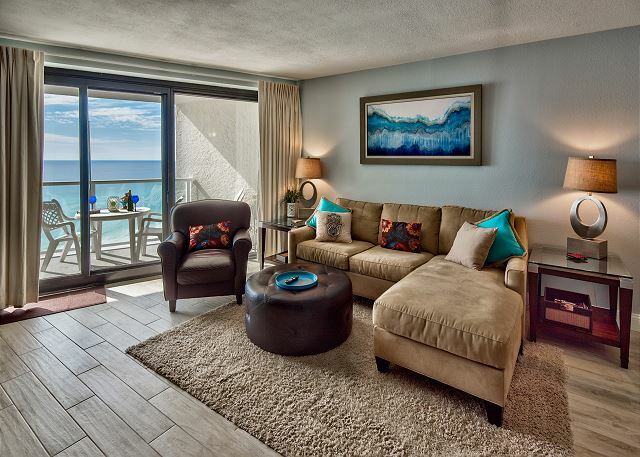 While relaxing you will enjoy the wonderful gulf views from the moment you walk in. 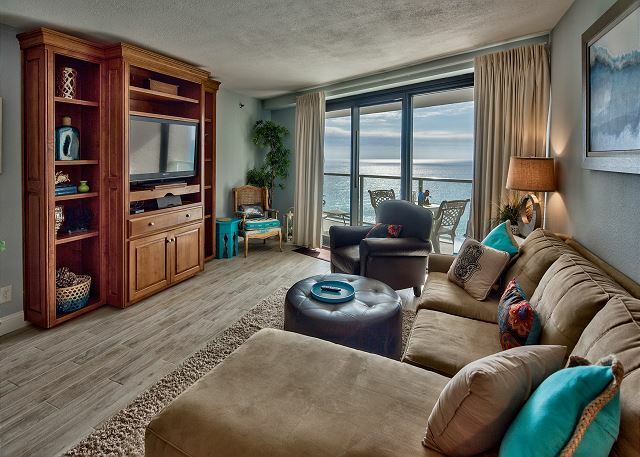 As you enter the condo you notice that this is no ordinary beach front vacation rental. 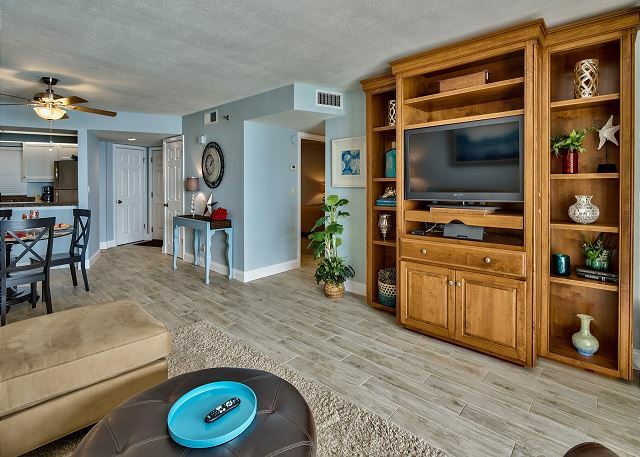 The entire condo welcomes you to sit and be mesmerized by Gulf waters and sugar sand beaches – whether on the large balcony, living area or kitchen! 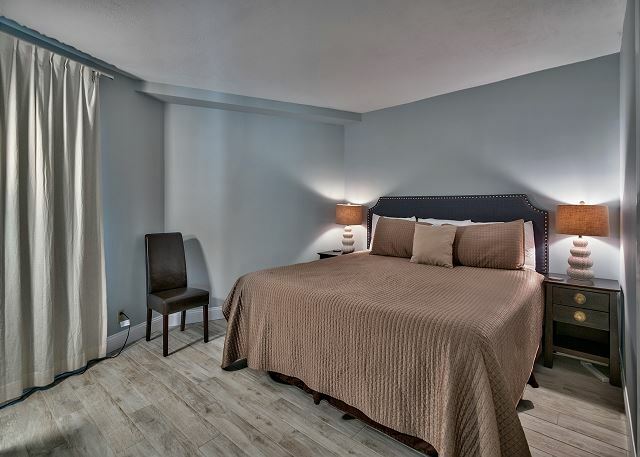 Sleeping arrangements include a king size bed with a new mattress in the bedroom and queen sleeper sofa in the living room providing you with additional sleeping quarters if needed. You may not want to leave this vacation paradise! Truly a vacation where memories are made! You may not want to leave this vacation paradise! Truly a vacation where memories are made! DESTIN MEMORIES is an independent company that is not affiliated with, sponsored by or associated with any entity containing the word “Sandestin.” Any use or reference to the word “Sandestin” is used in the factual sense to geographically identify a property or location and not to suggest any affiliation with any SANDESTIN® branded entity, product or service. Room was very clean! We loved the privacy and the ocean view was beautiful. Our 13th floor condo was just as pictured and very well-kept. We worked with Bette and she assisted in helping us find this room. She was quick to respond and answered all of our questions. This was our second year staying in the Beachside II, and we our already planning our stay again there next year! We have been taking at least one weeks vacation to Destin each year since my son was 3. 8 years later we still love it and it has been made better since we found Destin Memories several years ago. They are great to work with and truly make it a vacation with no stress. Nice place with a great view. Excellent experience from start to finish! Booking was easy and Bette was extremely helpful throughout the process. 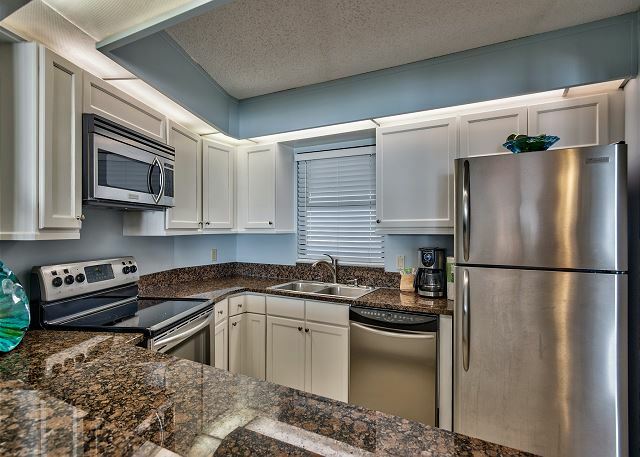 The Condo was beautiful and had everything needed to not only enjoy the beach but also to live normally (fully stocked kitchenware). From the beautiful well kept landscape to the very friendly guards at the entrance to the cleanliness of the entire building this condo was amazing. Our condo was a spacious one bedroom and was spotless. The view from the balcony was breathtaking and we watched the sunset every night we were there. Weather was windy and cool so did not use the pool. Overall it was not crowded so very quiet and peaceful. The beach was nice and again very well maintained. Highly recommend and will stay again. First time ever stayed on 13th floor as buildings usually don’t have a 13th floor. Only complaint would be that I couldn’t stay longer. Vous lever le matin, avoir la mer en face de vous comme si vous étirz sur un bateau de croisière, des couchers de soleil exceptionnels presque tous les soirs, le comfort d’un condo luxueux sur un site de rêve, c’est tout ça et plus encore. Bien que la température soit plus fraîche en janvier ( entre 4 et 20 C),l’endroit demeure merveilleux pour les joueurs de golf. Nous avons été conquis et nous y retournerons! Le personnel affecté à la location donne un service remarquable! We are so glad you came and enjoyed yourself and equally thankful for google French to English translation as follows which is my first and was quite enjoyable to find out what you said: You get up in the morning, have the sea in front of you as if you are stretching on a cruise ship, exceptional sunsets almost every night, the comfort of a luxury condo on a dream site, that's all and more. Although the temperature is cooler in January (between 4 and 20 C), the place remains wonderful for golfers. We have been conquered and will be back! The staff assigned to the rental gives a remarkable service! 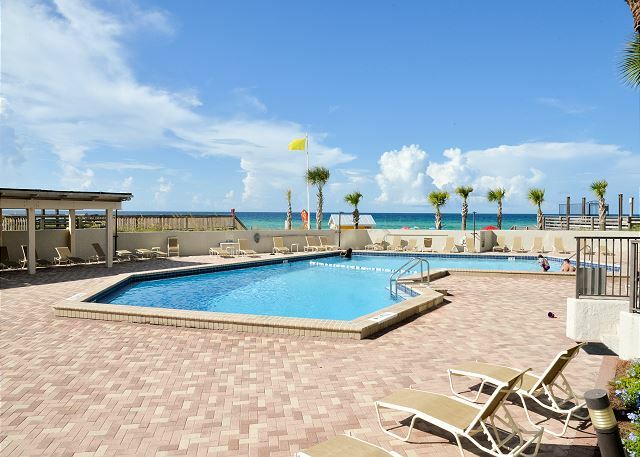 Very nice, clean rental with beautiful view of the Gulf of Mexico. Located near elevator. Easy access. New flooring. Balcony directly on Gulf w beautiful sunset views. I came to the beach to work and it was very nice to come back to the condo at the end of the day. 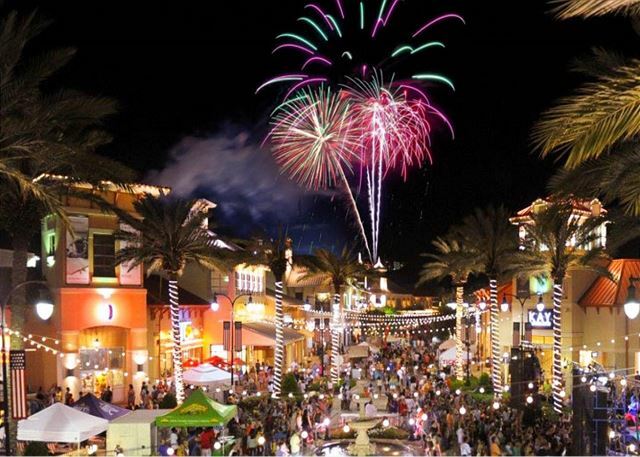 Sandestin offers so many activities. If I was not working, it would be easy to never leave the property. Management company was very responsive. For our honeymoon we had an amazing five nights in this beautiful condo. The pictures are spot on. It is beautifully decorated, and, even more importantly, it is spotless! 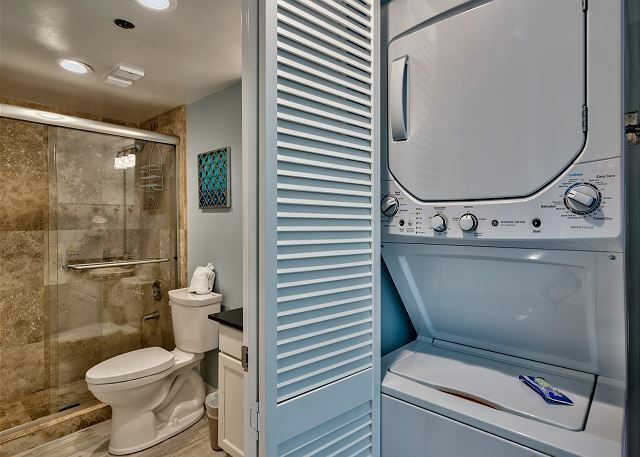 Love the location, love the condo! We will definitely be back! 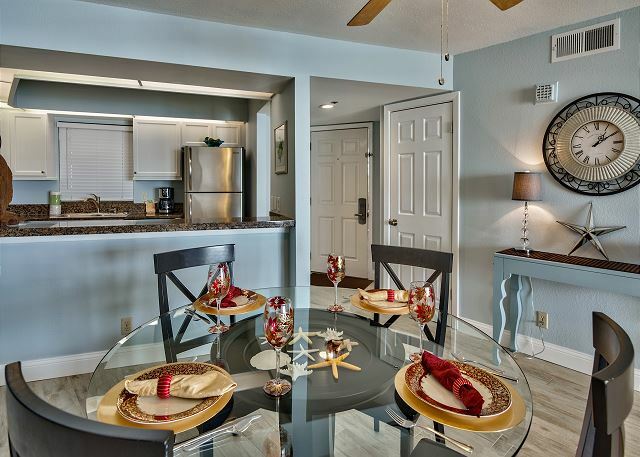 This condo was perfect for our 5 day stay since I had a conference at the Hilton next door. I didn't want to be in a "hotel" room for that long. Beachside II was really clean and had great views of the beach. This is the first condo that we have ever stayed at that had a huge "community" ice machine in the lobby for everyone to use on a daily basis at the beach. This amenity was a fantastic one of you bring an ice chest to the beach every day. The only thing that I would have liked to see on the premises would have been some smaller carts (shopping) carts to bring groceries to the condo. The decor was really nice, and the bed was extremely comfortable. Thanks for such a great place. We hope to be back next year if the dates are available. A great Condo with spectacular views! My husband and I had a great time staying here for an anniversary trip. It's not always easy to find places with a king bed but this condo fit us very well! The access to the beach was easy and convenient. Updates were very nice, just a bit of a low counter in the bathroom for us (I'm 5'10", husband is 6'3"). If you're accustomed to sleeping with a fan, you may want to think about packing a portable one since the master does not have a ceiling fan. Overall, we were very satisfied with our stay! You gave 5's for every category but the overall which I guess I don't understand. Being tall certainly has its advantages, but obviously not for the standard sink height. 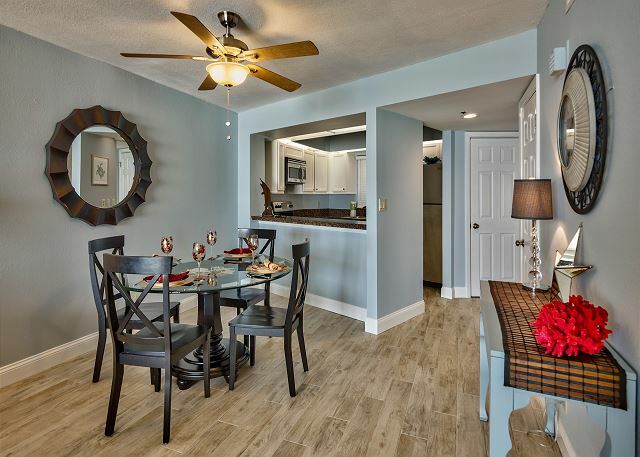 We are so glad you see what an updated unit this is and fit your expectations so well. We had a wonderful time in this condo. The whole process was really wonderful. We had to delay our trip due to a hurricane and the management company were so helpful and understanding. The even gave us a credit for the two days we missed. The condo was clean and the view was amazing!! Will stay again! We loved the resort and the unit. The balcony had a great view of the water and good location to shopping, restaurants, etc. We would definitely stay here again! We did, however, have a problem with our AC unit. We reached out to our contacts several times and never heard back from them. We had to thaw out our AC unit multiple times using a hair dryer to get the unit cooled. The last two nights were quite warm in the condo due to the AC unit freezing. I am so very sorry you did not get a response which is certainly not the norm. The AC has been fixed. It is a brand new unit that apparently had some kinks in it. Please come again. The condo was very nice and the location couldn't have been better. The condo was comfortable and the decor was very nice. My only complaints were the full time use of the huge plunger that was placed next to the toilet. It caught my attention when we first arrived I just didn't realize it would need to be used so often. There is very little light(2 lamps) in the bedroom which made it very difficult to find anything in the closet. The patio furniture needs to be replaced. The owner changed the patio furniture right after you left. They will certainly look into the light issue. As for the toilet, we have oncall 24/7 and they would have gladly come and taken care of any issue. That is what we are there for, to help you when needed. 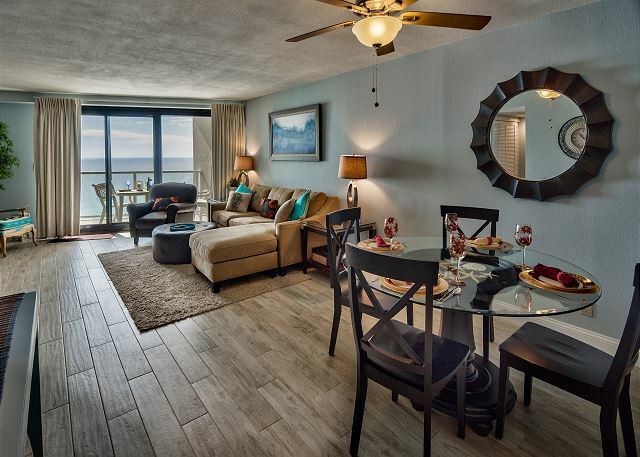 We spent the month of February in Destin at Beachside II. It is a beautiful place! We had not stayed in this condo before. We loved it! The view is spectacular, the condo is lovely, well furnished and very comfortable. Bette was very easy to work with and handled everything to our satisfaction. We will be returning to this property and using this property management company! We enjoyed our stay at 4327 Beachside. 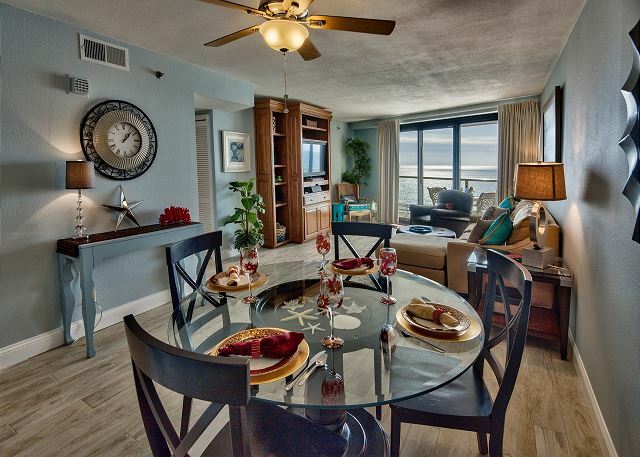 We were very impressed by Betty and the staff at Destin Memories! We had an issue that was resolved thoroughly and on the same day we reported it. The best help we've ever received on a rental unit. They are a great company to rent from. The unit itself is well maintained and a good value being right on the beach. The elevators are fast and it's a very family friendly location. The only drawback with this unit is that the master bedroom is not on the ocean - but the den has a nice balcony that is fun to have breakfast on. Overall, a very nice vacation. FYI - they have a brand new mattress and bed in the master bedroom - very comfortable indeed. This was a vaca for just my husband and I. He just returned from a deployment and we could not have asked for a better time!! Thank you so much for a beautiful condo with a gorgeous view! We loved relaxing on the patio enjoying the ocean view! Loved it! The rental unit was clean upon arrival. All of the necessary information was sent via email prior to our departure. We loved the convenience of the resort shuttles and the view from the unit. We will definitely be back!